When you want to use CSS code to customize the appearance or behavior of elements on a particular page, you need to know its page ID. Hover over the Website menu and select the Site pages option. Click the page within the list. 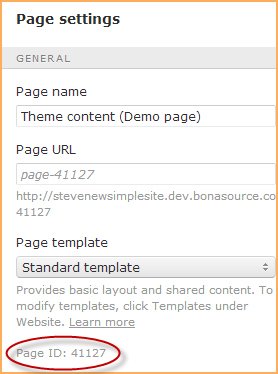 Within the page settings that appear, the page ID appears at the bottom of the General section, under Page template. To reference the page ID in code, you need to prefix it with #PAGEID_ (e.g. #PAGEID_41127). Above example will change the color of H2 tags on the identified page.